Did you know that you can get yourself a whole radio shack in a small box? For less than $1000? That’s Yaesu FT-857 for you. It’s got all the bells and whistles that you could possibly want from a mobile VHF/UHF/HF transceiver. Of course, the real selling point is that it’s STILL the most compact 100-watt HF/VHF/UHF transceiver on the market. This small radio does everything. You get base station-type performance from an ultra-compact package. And if you treat it good, it’ll last you 8-10 years easily. Sure, there are better (more modern) HF stations out there. But for the price, the FT-857D has no competition. For me, this makes FT 857D the best choice for high-performance mobile operations. It’s also a great starter radio if you’re still learning or starting out. You have everything included, so you can decide where your passion really is (HF/VHF/UHF/Digital). Once you know that, you can always get a rig that’s more specialized. This little radio has some downsides due to its age, but none of them are dealbreakers. The menu system is not intuitive at first. This is one of the most common complaints that people have with the radio. It will take you some time to get used to. You’ll need to use the manual a lot when first starting out. For me it took a few weeks of messing around with every feature. Now that I’m used to the settings, the radio is easy and enjoyable to operate. Also expect to spend around 30 minutes setting up the radio after you get it. But after the inital setup, most of its functions are set and forget. Side note: The operating manual is excellent for this radio. Plain, easy-to-read English. I had no trouble finding my way across the menu. The radio has an adjustable LCD display 32 colors and contrasts. You can view it in any type of light environment. I tend to stick to the Yaesu orange. What I like is that ALL the details can be seen on the display. The smallness is not an issue and you’ll get used to it eventually. I have read about people having display issues. Can’t comment on that myself, as I haven’t had them. Keeping the radio in direct sunlight seems to damage the screen over time. The glue comes loose on the display when the sun shines on it according to some sources. You need to shine a lot of heat for a long time for that to happen. Just use common sense and don’t leave the radio in the sun (especially if you’re from the south). 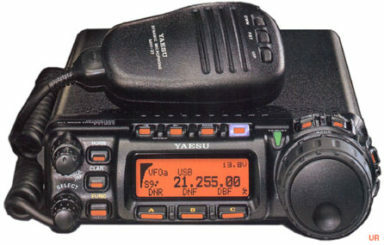 The FT-857D measures 6.1” x 2” x 9.2”. 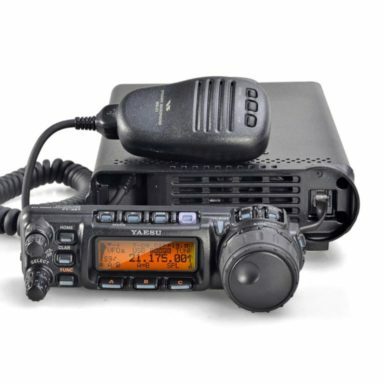 Versatility and portability is where the FT-857D really shines. It’s easy to use indoors, but you can also take it out camping (on a gel battery) or set it up in your car. With the additional remote kit, you can even attach the front panel to the windscreen of your car. That way, most of your rig will be stored out of sight. It’s still the world’s smallest 100W HF/VHF/UHF transceiver as far as I know. Which is very surprising, considering that this bad boy was released in 2003. Side note: It is on the heavy side, but that’s understandable with the amount of gear that they’ve packed in there. Even with it’s small size, I find the radio very natural to operate after you get used to the menu. All of the controls are lighted, so they can be operated in the dark. You can locate all of the buttons with a quick glance. I like the feel of the buttons. They’re very tactile. Very satisfying to press, for lack of a better word. You can set the step size individually for each HF band. You can lock the big dial on the right side of the radio to keep it from moving accidentally. A specific noise reduction button. It’s the third key from the top. It’ll do for long-term home base use. It even has metal legs for table placement. But you might miss having a bigger screen and better controls. One thing you can do is connect the radio to the PC and control it with software from there. You’ll have all your controls on the monitor. That’s much better than the small screen. If you think that you’ll ever need to operate this radio from anywhere else than your home… it’s very hard to beat on versatility. While it performs decent, this radio’s got some older tech in it. The FT-857D version has been around since 2003, but the original FT-857 (where most of the tech comes from) was first released in 2001. 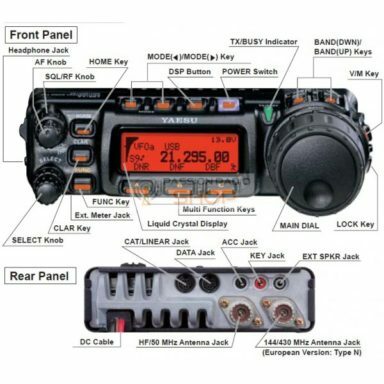 Full FT-857D Specifications. Despite being older, the radio works just fine. Shortcomings covered below. Transmitter coverage of the HF, 50 MHz, 144 MHz, and 430 MHz Amateur bands. Receive coverage on 100 kHz to 56 MHz, 76 to 108 MHz, 118-164 MHz, and 420-470 MHz. Something many people don’t know is that it can do SSB (Single-Sideband Modulation). The design is old compared to newer radios. But it’s not bad. Newer radios have improved filters that help out on bad band conditions. 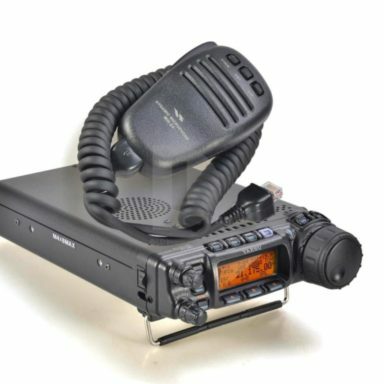 My biggest gripe with the FT-875D is that the receiver is not on par with newer radios. Don’t get me wrong – It works well. But a tad bit inferior to more modern radios, such as the FT-450D. One thing you must know is that FT-857D does not have a roofing filter. If there is a signal close to you transmitting on the same band, the radio will blank out. You’ll need to restart it and change the band. This is not an issue usually and has never happened to me. But something to keep in mind in case you go to a field day. The DSP noise remover blanks out the noise real well. However, it also distorts the audio signal a bit. After about 9/15 setting, the audio starts sounding “underwater”. Still for the price the DSP unit is great. There are high pass and low pass filters that you can activate independently of noise removal. They work well for isolating the noise. The radio comes with a basic hand mic that has a mounting bracket. Great quality on the included mic. You will be heard loud and clear on the air without having to do anything special. Works as it should. If you get an upgraded hand mic, you can control every aspect of the radio. It even has a small VFO control. You’ll have direct frequency entry with the external microphone. The audio quality on the included speaker is good and will be enough for most situations. But for some real use in non-mobile situations, I recommend you to get a quality external speaker. The covers of the radio are made from steel. It’s built to survive and work through long-term heavy-duty use. The radio feels very solid for its size. It’s got feet that flip down at the bottom. This makes the radio good as a base inside. It sits well on the table. There’s a long power cord for easy mobile installation. You won’t won’t need an extra cord or extension to put the radio in your trunk. You’ll need to stick with these included power cords. This is not a model you can plug into your cigarette lighter. Due to it’s size, there is no built-in antenna tuner in the radio. Then again, it would be hard to fit more stuff into this radio. The antenna is screw-down. You should know that the microphone jack is placed behind the front panel on this one. Not an issue usually, but it’s a little more of a hassle to de-attach the microphone for transporting. Connecting headphones is easy – there is a jack on the front left side. Finally – there is a HUMONGOUS amount of accessories available for this radio. Antennas, filters, oscillators and hand mics – whatever you want for customization. 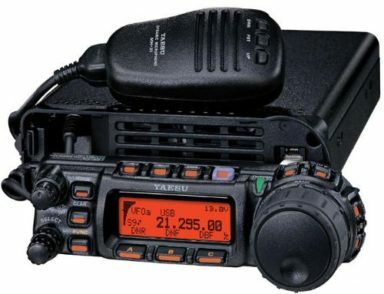 Yaesu FT-587D is a proven workhorse. People report getting 8-10 years of use on these radios. Your mileage may vary, but I’d count on 5 years MINIMUM. I didn’t find a single complaint online about one of these breaking down. Pretty much what I expected. Expect this radio to last you for years. The only exception… are the problems that some people have had with the screen’s prolonged exposure to sunlight. Something about the glue coming loose inside the screen. So, A small piece of advice would be to keep the digital panel out of the sunlight whenever possible. Just use common sense and you’ll be fine. UV rays and heat can destroy many materials inside the radio over time. Many people don’t remember that Yaesu FT 857D was used in several dxpeditions. For example it was one of the radios used for BH7S. Also – the radio is a blast to operate (once you get used to the controls). Something about the light weight, “toss it in the truck, open the hood, operate off the top of the radiator” made it a lot more fun for me. Does FT-857D Cover 60m Channels? Yes it does. If you want to learn more, here are the official ARRL regulations regarding the 60m operation . Can you use it as a police scanner? Yes, although many police channels have gone digital. You’ll have to get a scanner that will decode digital modes. They’re significantly more expensive. If you’re starting out with ham radio, this is the perfect radio for you. You can do all bands, including 60 meters. All broadcast bands, all air bands. You’re getting the most compact transceiver on the market. This radio is a shack in a box. It’s incredible how much they managed to pack into such a small package! This is one of those cases where you get what you pay for. I really would recommend this radio to everyone, provided that your wallet can handle it. If you can afford it at the start – buy something that will take you from where you are right now to where you might be in a few years. It’s the most cost effective option long term. Compared with buying and selling gear two or three times over. You can expect a MINIMUM of 5 years of use. Probably more. So the ~$800 broken out over 5 years mentally is only $160/year. It will probably be even less, since the radio lasts so long. Please let me know in the comments if I missed anything. Nice little radio, mine just had it’s 5th birthday a month ago. Thinking of buying another as a gift for my father.